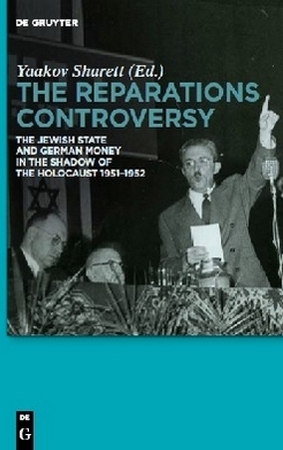 The Reparations Controversy, concerning the issue of reparations ("Wiedergutmachung" in German; "shilumim" in Hebrew) by Germany to Israel , brings together selected protocols of all debates held in the Knesset, in its Foreign Affairs and Security Committee, in the Government and in the high councils of the ruling party Mapai, regarding conducting negotiations with the West German government. This is the first book documenting confidential protocols lately opened to the public. With the elaborate introduction by Yechiam Weitz, this book serves as a basic textbook for an important chapter not only in Israeli and German history, but also in post-war history in general. The Reparations Controversy was published in 2011 by the prestigious publishing house De Gruyter. It was condensed and translated from the Hebrew book of the same name published by the Moshe Sharett Heritage Society in 2007. The whole book in Hebrew is on the website and is fully searchable. The Reparations Controversy is available for purchase at Amazon. Prices are $100-$150. Read Yossi Sarid's review, "the most interesting boring book I have read in the past few years". Correspondence Between the Foreign Ministry Legal Advisor and the Foreign Minister - A very interesting excerpt from the book.